How To Coupon: One Per Purchase Or One Per Transaction? 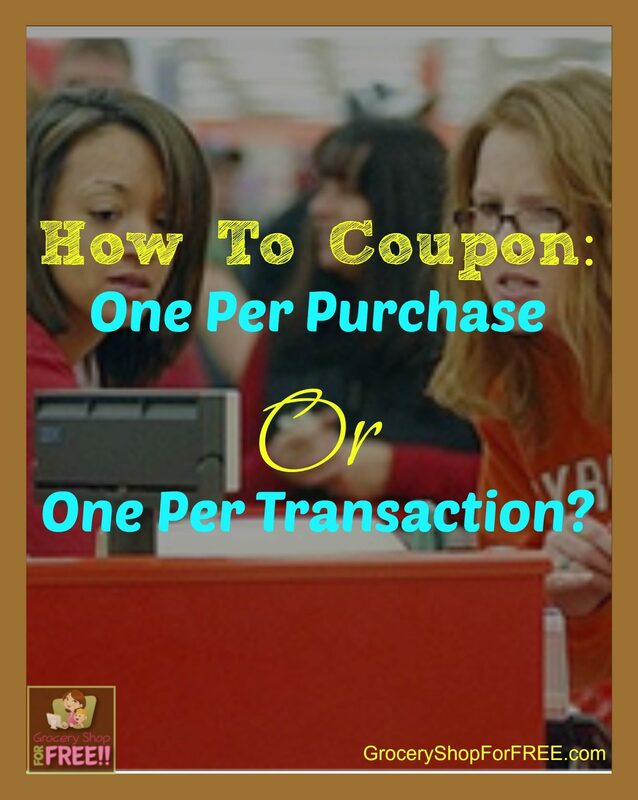 You are here: Home / Finance / Couponing / How To Coupon: One Per Purchase Or One Per Transaction? How To Coupon: One Per Purchase Or One Per Transaction? The question I am asked most often by far is about the words: One Coupon Per Purchase. In one form or another you will find those words on every coupon! There is nothing that confuses a cashier more than those words. I will also say it is the number one reason a cashier will tell you that you can’t use a coupon. It is also probably the most important thing you need to learn because it will come up repeatedly and you WILL have to educate a cashier and/or manager at some point! The question I am asked most often by far is about the words: One Coupon Per Purchase. In one form or another you will find those words on every coupon! For some reason it confuses shoppers, cashiers, and even managers. What it means is you cannot use that 1 coupon on 20 of the same product. You need 1 coupon for each product. For example: If you have $1/1 Coke product, you can get $1 off of 1 Coke product – that is 1 purchase. If you have 2 Coke products and 1 – $1/1 coupon you can only get $1 off of 1 – you cannot use that coupon on both Coke products. If you have 2 – $1/1 coupons and 2 Coke products you can use 1 coupon on the first Coke and 1 coupon on the second one. Your coupon beeps, the cashier reads the coupon and then says, confidently: “It says 1 per purchase – you can’t use this one.” I hear this from cashiers ALL THE TIME! They are just looking for a reason to give as to why it beeped, and that is the first one they see. Here’s where the confusion happens. People are confusing purchase with transaction. A purchase is 1 product (in the case of what is on a coupon) and a transaction is the entire order. So, if a coupon said 1 coupon per transaction – you would only be allowed 1 coupon for the entire order. But, since they say one per purchase that means you can use 1 coupon for each item you purchase. I hope that answers the question: One Per Purchase Or One Per Transaction! What are some other questions you have about couponing or something a cashier or manager has told you that you aren’t sure if they were exactly right about? Be sure to check out all of the posts in our How To Coupon series! The problem I run into is when they say that to you, and you tell them “no, one item is one purchase, so 3 items is 3 purchases..” they will stand there and tell you “no, you can only use one”. How do you deal with THAT part? Sometimes I get them to understand, sometimes I don’t. It’s VERY frustrating to argue with a cashier when you have a stack of coupons. Someone is telling you that you don’t know how to do your job, that you are wrong and they know your job better than you. If you keep that frame of mind it may make it easier for them to “get” what you are saying – otherwise they become defensive and you can’t talk to them then. When all else fails ask for a manager or call customer service to resolve. The problem I run into at one of my stores is their policy states that the do not accept internet printed coupons for “free” items. However, some cashiers and managers seem to interpret this to also include the “free with purchase” coupons, such as B1G1 free. I see that they are definitely two different types of coupons. This is completely randomly enforced at the store so I never know if they are going to accept my coupons or not. I know how frustrating it can be. You need to get a manager to agree with you and get their name and use it, when need be! If the manager is mistaken as well start up the chain: Got to the DM, the RM, and finally corporate, if you have to and get a name and use it. I hope that helps! I hate when they don’t have their act together. If a store has a item on sale for $.99 and we have a coupon for $1.25. 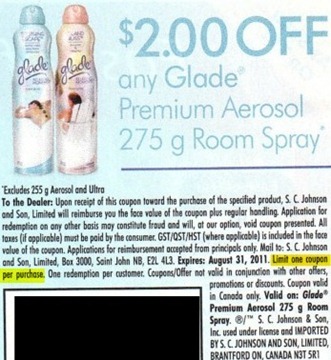 When the store sends in the coupon does the store Only get credit for what their sale price was? Or the full face value of the coupon? They get the full value of the coupon unless the coupon has an “up to” price. Those are the coupons where they have a place to write in the actual cost of the item, those they get back the price written on the coupon by the cashier. If I’m told 3 is not 3 purchases… I pay separately! I’ll even get back in line but I WILL use a coupon per item. Now they know what I’ll do if they get picky and they don’t mind ringing up separate transactions. The Target by me gets this wrong all time. The company has started cracking down on coupon users so hard that the employees will find every way they can to get out of taking my coupons. I even told the manager that it is no different for me to walk in and out of the store 3 different times. She had the nerve to say they wouldn’t let me do that either. This Target management claims a purchase and a transaction are the same thing. How can I show them otherwise? The only way I can do it is to have corporate or someone smarter and higher up to explain it. I have argued that issue a thousand times. I hope that helps, it’s a very common problem for sure. What if cashier and manager argue over the “per purchase” says it does mean 1 per transaction. I have even pulled it up on my phone to show 1 per purchase is 1 q per item but they say no I can only use 1 coupon for entire transaction? ?? That’s when I call the District Manager or Corporate – SOMEWHERE, SOMEONE knows what that means – I just have to find them! lol I know it’s frustrating – I have been there, But, if you call the District Manager and/or corporate – it generally gets worked out. this is ALWAYS the issue at any Walmart! Not even calling corporate helps as they too are clueless with this. Ugghh. I stopped couponing altogether. An employee at Walmart accused me of ripping them off by using coupons. Target has people following me around the store like I’m a criminal. I just got tired of the whole experience. I am sorry to hear that. Stores don’t lose money by taking coupons, that’s for sure. Poorly trained employees make it a bit harder, I do agree. So agree with Kathryn and C, i had a recent bad experience at Walmart and the manager made it loud and clear he wanted me to call corporate because he knew they would do nothing. We had a coupon issue which was a peelie we found on the EVOL frozen foods, we bought 4 only one coupon scanned, cashier called him over her read coupon looked at me and rudely said “ive told you already before you cannot do this and you cannot use this” i looked at him like WTF.. Who are you talking to but i held my calmness, all i said was excuse me, he proceeded with telling the cashier and disregarding us that if we wanted to purchase them we would need to make separate transactions then he proceeded to walk away. We only bought ONE.. I was upset with his rudeness and the purchase was not mine it was my daughters so for him to be rude to me i was even more livid. Before i left the store i approached him and i politely told him there was no need for him to be rude nor disrespectful to me, that was not my transaction nor my coupon he rudely again said you coupon so you should have read the coupon and if you don’t like it go to another Walmart, i argued with him i never come in there and fistespect anyone nor disagree with there policy nor there decisions so there was no need for his behavior he continue to get LOUD in front of customers and arguing with me saying if i don’t like it call 1800walmart and what his name was and laughing.. Uugghh he really pissed me off .. Make you feel like you do not wish to go there no more.. But then i go down the street to Shoprite and i see many ladies coupon there and then i see people following them like workers and security n loss prevention.. Why? They are shopping not stealing!! Just so uncomfortable! I have also had this problem at Walmart and am thinking about using self check out next time I go, have any of you ladies tried the self check out approach? any less drama?